1) This paper was presented at FIG Working Week in Rome, 8 May 2012. In this paper our Japanese colleagues show in a very impressive way how the huge and dense GEONET – GPS network of Japan was used after the Tohoku earthquake, which occurred on March 11, 2011. The Geospatial Information Authority of Japan (GSI) stopped providing ‘Survey Results’, but was able to restart this service in a effective and accurate way just some months later after a very active and fundamental phase of re-measurement and recalculation. Large-scale crustal deformation over a wide area of eastern Japan was detected by GEONET, Japan's dense Global Positioning System (GPS) network, following the 2011 off the Pacific coast of Tohoku Earthquake occurred on March 11, 2011. Since it was assumed that coordinates of the control points for public surveys, such as GEONET stations, triangulation stations and leveling bench marks, in a wide area were greatly changed and could hardly maintain consistency between nearby stations, the Geospatial Information Authority of Japan (GSI) stopped providing ‘Survey Results’ of them, which were the coordinates for survey use, and announced it publicly on March 14, 2011. In order to promote various public restoration programs in the affected area, it was strongly required to revise the Survey Results in urgent. On the other hand, because large postseismic deformation had continued widely after the event, it was concerned that even if the Survey Results were updated immediately, they would become unavailable in a short time. Therefore GSI examined the optimal timing to calculate their new coordinates by predicting the amount of future postseismic movement based on the observation data of GEONET stations. 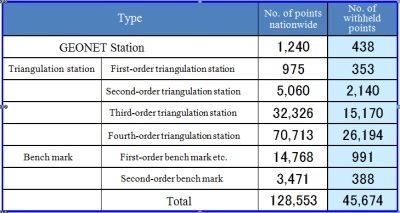 Eventually, the new Survey Results of GEONET stations were published on May 31, 2011 and those of triangulation stations and leveling bench marks were done on October 31, 2011 respectively. In this paper we report the revision process of the Survey Results after the 2011 Tohoku Earthquake. The 2011 off the Pacific coast of Tohoku Earthquake (hereafter ‘Tohoku Earthquake’) was such a major seismic event (Mw=9.0) that occurred at 05:46:23UT and triggered a huge tsunami, causing severe and catastrophic damages along the coast of Tohoku or Kanto district. 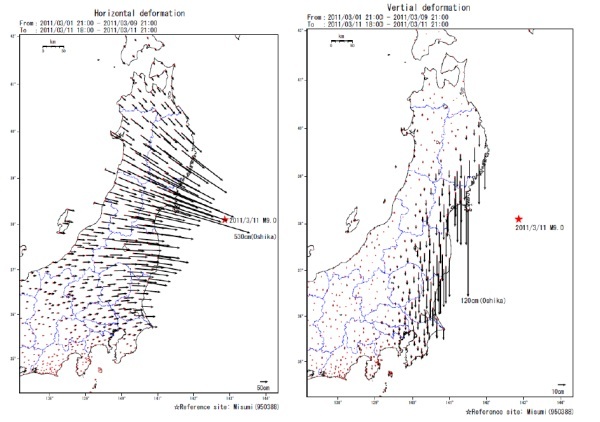 On this event, large-scale crustal deformation was detected by Japan's wide and dense GPS observation network (GEONET), which had been operated by Geospatial Information Authority of Japan (GSI) since 1996. The station ”Oshika”, which is located close to the epicenter, was moved about 5.3m to the east-southeast direction and subsided about 1.2m for instance (Fig. 1). After the main shock, postseismic deformation has been continued widely along the Pacific coast area of eastern Japan and local scale crustal deformations have been observed due to some aftershocks (Suito et al. [2011a, 2011b]). Under those circumstances, it was assumed that the Survey Results of control points, which were coordinates for survey use, were significantly different from their original positions and should no longer be available for the use for public surveys. On carrying out the public surveys, precision of the relative position between nearby control points is crucial in terms of maintaining consistency. After some previous earthquakes, such as 2003 Tokachi earthquake and 2008 Iwate-Miyagi earthquake, GSI has examined the area of stoppage of provision of the Survey Results by calculating the amount of crustal strain values by earthquake fault models, which were estimated based on the data from the GEONET stations and determined it with the criteria approximately 2ppm (equivalent to 2cm per 10km). According to this policy, we stopped publication of the Survey Results of the GEONET stations and the triangulation stations of 16 prefectures on March 14, 2011, immediately after the Tohoku Earthquake. In addition, the Survey Results of the leveling bench marks were also suspended on the same day along with leveling routes where estimated vertical deformation was more than a few centimeters. In the course of evaluating the recalculated Survey Results of GEONET stations, it came to light that in addition to 16 prefectures, the Survey Results of Toyama, Ishikawa, Fukui and Gifu prefectures were also needed to be updated due to accumulated crustal strain. Therefore, we additionally stopped provision of the Survey Results of triangulation stations in these four prefectures on May 31 when the new Survey Results of GEONET stations, were released. The number of representative control points, including ones with the suspended Survey Results after the Tohoku Earthquake is listed in Table 1. Specifications for Public Surveys, the accuracy required for calculating Survey Results of GEONET Stations should be to a point-to-point relative accuracy of 2ppm. where c and a are the constants, τlog is the time constant and t is the time elapsed from the earthquake. The appropriate time of re-publication of revised Survey Results was then discussed based on the predicted deformation (Fig. 2). As a result, we decided that new Survey Results of GEONET stations should be published by the end of May. Conventionally, new Survey Results were calculated based on existing results. 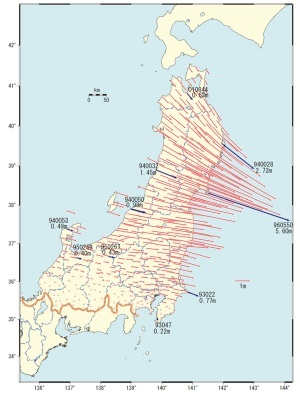 However, since crustal deformation occurred across a large area due to the Tohoku Earthquake, coordinates that correspond to International Terrestrial Reference Frame 2008 (ITRF2008) were calculated based on observation results at the VLBI (Very Long Baseline Interferometry) station (TSUKUB32) located in GSI, Tsukuba, and GEONET. These calculated coordinates were then adopted as new Survey Results for the area where update of Survey Result was required. Existing Survey Results had remained in western Japan and Hokkaido, where there was less crustal movement due to the earthquake. We recognized inconsistency at the boundaries between the existing and updated Survey Results and corrected them with the model described in 3.1.3 to ensure the required accuracy for surveys. The coordinate of TSUKUB32 on ITRF2008 was estimated on the analysis of VLBI observation data of international VLBI session "IVS-R1482", which was conducted on May 10, to adopt the latest coordinates for the revision of the Survey Results. We constrained the ITRF 2008 coordinates of five overseas stations, which were not affected by the earthquake, and the coordinates of TSUKUB32 were calculated. The calculation method for Survey Results with observation results of the VLBI and GEONET is as follows. First, the postseismic deformation was calculated from the difference in averages of R3 solutions at the GEONET Station 92110 (located in GSI, Tsukuba) between May 8-12 and May 22-26. Next, we calculated the coordinate of TSUKUB32 at 12:00 UTC, May 24 by adding the postseismic deformation to the coordinate calculated from VLBI observation at 5:00 UTC, May 10. The coordinates (ITRF2005) at 12:00 UTC, May 24 were calculated by averaging the R3 solution data in May 23-25. Then, we transformed the reference frame from ITRF2005 to ITRF2008. Lastly, we combined (1) and (2) with the collocation result in 2007 (Miura et al. ) and shifted the R3 solutions so that they were consistent with the coordinate of TSKB based on VLBI. The shifted R3 solutions (R3’ solutions) were used as new Survey Results of GEONET Stations that are located in the area for which publication of Survey Results had been stopped. To obtain the elevations of them, Japanese Geoid Model 2000 (Nakagawa et al. ) was subtracted from ellipsoidal heights of each GEONET Station. Discrepancies across the boundaries of areas with updated Survey Results and those with no updates had been caused by accumulated crustal strain since January 1, 1997 - when Geodetic Coordinates 2000 was published- . Thus, we calculated correction values for the revised Survey Results so that the amount of discrepancy across the boundaries became 2ppm or smaller. Since the strait lies between the main island of Japan and Hokkaido, corrections were applied to only western boundaries region. The corrections were not applied for the elevations, because they were confirmed to satisfy the tolerances specified in General Standard of Operation Specifications for Public Surveys. The differences between the new Survey Results and previously established results at each GEONET station are shown in Fig. 3. It should be noted that the Survey Results mainly around the Tohoku district had differences as large as 5m whereas the amount of differences progressively decreased as getting closer to the western boundary . It was also confirmed that discrepancies observed within the corrected area were mostly smaller than 2ppm, which would not affect public surveys in that area. On May 31, updated Survey Results of 438 GEONET stations were released, and it became available to carry out public surveys using GEONET stations in the affected area and its vicinity. On the same day, publication of Survey Results of triangulation stations installed in Toyama, Ishikawa, Fukui and Gifu prefectures were stopped. In Article 11 of the Survey Act, it is stated that for basic surveys or public surveys, the standards for position are that it be represented by geographical latitude and longitude and height above the mean sea level. For this, a survey origin for the geographical latitude and longitude is Nihon Keiido Genten (Origin of the Japanese Horizontal Control Network) and an origin for the mean sea level is Nihon Suijun Genten (Origin of the Japanese Vertical Control Network). The position and coordinate/elevation of the origins are respectively prescribed in Article 2, Paragraphs 1 and 2 of the Order for Enforcement of the Survey Act. Since the positions of the Origins of the Japanese Horizontal and Vertical Control Network had shifted, resulting in the prescribed coordinate and elevation being far off the current position after the earthquake, the coordinate and elevation of those origins were amended to ensure the accuracy of surveys. To newly calculate coordinate of the Origin of the Japanese Horizontal Control Network, Global Navigation Satellite System (GNSS) observations were conducted between June 21 and 25 at the VLBI marker for TSUKUB32, which is installed on the GSI in Tsukuba, as well as at the Origin of the Japanese Horizontal Control Network. The coordinates of the Origin of the Japanese Horizontal Control Network newly calculated through these observations and the azimuth from the Origin of the Japanese Horizontal Control Network to the VLBI marker for TSUKUB32 are shown in Tables 2 and 3 respectively. Sea levels recorded at the Aburatsubo tide station before and after the Tohoku Earthquake showed that no significant tidal change associated with the earthquake was observed. Although GPS observations showed that "P Aburatsubo" (GPS observation point located in the Aburatsubo tide station site) and the GEONET station "Miura 2" located nearby had sunk by several centimeters following the March 11 earthquake, the amount of sinkage tends to decrease with the progress of postseismic deformations. 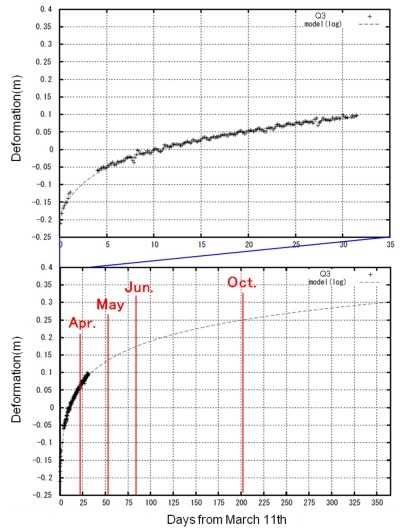 No significant change in ellipsoidal height was observed between pre-earthquake (January 2011) GPS observation results and post-earthquake (July 2011) results in terms of uncertainty of GPS observations. Therefore, new elevation of the Origin of the Japanese Vertical Control Network was calculated through the following procedures (1) and (2) and then verified by the procedure(3). When the elevation of the Origin of the Japanese Vertical Control Network was fixed based on leveling results from the region between the Aburatsubo tide station and the Origin of the Japanese Vertical Control Network in January 2011 prior to the earthquake, the height of the reference point at the Aburatsubo tide station was determined to be 2.4173m. By fixing the elevation of the reference point at the Abratsubo tide station obtained in (1), the new elevation of the Origin of the Japanese Vertical Control Network calculated based on leveling results of July 2011 was determined to be 24.3904m. For verification, the elevation of the Origin of the Japanese Vertical Control Network was calculated based on the results of leveling between the VLBI marker for TSKUB32 and the Origin of the Japanese Vertical Control Network with the result of 24.4007m. With regard to standard deviation of the network adjustment of the leveling, since the estimated error of +/-0.0026m may be contained in the results shown in (1) and (2), the newly amended elevation of the Origin of the Japanese Vertical Control Network should be 24.3900m after rounding off the ten-thousandth place. Since the coordinate/elevation of the origins of the Japanese Horizontal/Vertical Control Network were prescribed respectively in Article 2, Paragraphs 1 and 2 of the Order for Enforcement of the Survey Act, the order needed to be amended. Also, because Article 11 of the Survey Act requires Survey Results of control points to be expressed relative to these origins, the order for enforcement must first be amended before the Survey Results of control points can be revised. After being processed through required procedures, a cabinet decision on the amendment of the Order for Enforcement of the Survey Act was reached on October 18, 2011, followed by promulgation and implementation on October 21, 2011. To ensure accuracy of the revised Survey Results of triangulation station, it is desired that surveys are conducted on-site at triangulation stations. However, in terms of time and cost it is not always practical to conduct surveys at each and every triangulation station due to the fact that publication of Survey Results for more than 40,000 triangulation stations was stopped. Since the observed crustal deformation due to the Tohoku Earthquake was relatively similar in a wide area, precise geodetic surveys were to be conducted only at a selected number of triangulation stations - similar to practices followed after the Tokachi-oki Earthquake in 2003 (Doi et al. ) - and triangulation stations not targeted for resurvey were to have their Survey Results recalculated using correction parameters. In addition, latitudes and longitudes of triangulation stations in the affected 20 prefectures (including Tokyo) for which publication of Survey Results was stopped were to be revised. Elevations of triangulation stations in six Tohoku prefectures and Ibaraki also needed to be revised since significant vertical movements (more than 10cm) immediately after the earthquake and certain vertical movements due to postseismic crustal activities were observed throughout the Pacific coast area covering the Tohoku district and Ibaraki. While conducting triangulation station surveys and precise geodetic surveys after the March 12 earthquake which occurred near the boundary between Nagano and Niigata prefectures, elevations of that area were revised as well. Within the area for which publication of Survey Results was stopped, precise geodetic surveys were conducted at 595 points. Also, within the Pacific coast area (close to the epicenter and tsunami devastated sites), the Nagano-Niigata boundary area and the Hamadori region of Fukushima where one of aftershocks occurred on April 11, resurvey of 1,272 triangulation stations were conducted. Of the triangulation stations not slated for resurvey, 73 stations had their Survey Results recalculated based on data of previous observation. For remaining triangulation stations, a new set of correction parameters were developed and Survey Results of the triangulation stations were recalculated using PatchJGD, the software for correcting geodetic coordinates (Tobita, 2009). The number of the stations recalculated by the software was 41,392. To recalculate the Survey Results of triangulation stations, correction parameters for coordinates (horizontal) and elevations were developed using both previous and revised Survey Results of GEONET stations and the triangulation stations for precise geodetic surveys. The correction parameters were constructed by estimating variations at the southwest corner of a third-order mesh code from displacements of GEONET stations and triangulation stations using the Kriging method and were extracted so as to cover the land area. The constructed parameters were not only used for recalculation of triangulation stations but were also available to general users for use in corrections of public control points. For this reason, the coordinates calculated through the correction parameters were verified (external evaluation) through comparison with coordinates obtained through actual surveys. The verified results showed that deviations of more than 90% of triangulation stations were within 10cm of the correction parameters for coordinates and were within 20cm of the correction parameters for elevations. However, some triangulation stations had discrepancies of more than 50cm. Since such cases are extremely rare, it was highly likely that errors took place after obtaining previously established Survey Results. 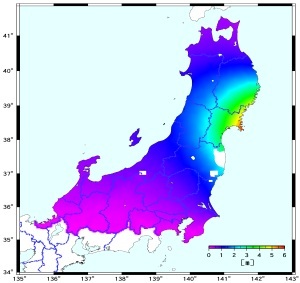 It should be noted that exclusions due to it being impossible to check the accuracy of the correction parameters included the area within a 30km radius of the Fukushima No.1 nuclear power plant, the planned evacuation zone and regions where crustal deformation due to relatively large aftershocks following the Tohoku Earthquake occurred as observed through surveys from GEONET stations and Synthetic Aperture Radar (SAR) interferometry. The revision of Survey Results for triangulation stations not slated for resurvey was carried out based on these correction parameters (Fig. 4 and Fig. 5). The target accuracy of the correction parameters for elevations used for the revision of Survey Results of triangulation stations was 10cm to 20cm and those parameters cannot be applied in the revision of Survey Results of bench marks that requires elevation accuracy of 0.1mm to 1mm. Therefore, revision of Survey Results of bench marks were, in essence, to be done through resurvey, and network adjustment with multiple reference points was calculated based on the updated elevation of the Origin of the Japanese Vertical Control Network and high-precision 3D surveys (leveling) conducted in the Tohoku and Kanto districts. When calculating network adjustment, it was essential to minimize the impact on areas that do not include resurvey-slated leveling routes so as to ensure a certain degree of accuracy. To do so, network adjustment had to be calculated by designating multiple bench marks that were not affected by the earthquake as reference points. The reference points were determined, after discussion, to be the first-order bench mark 5527-2 located in Ninohe of Iwate as well as the Origin of the Japanese Vertical Control Network. Revised Survey Results of bench marks obtained by network adjustment calculations based on these two reference points were released on October 31. Fig. 6 shows the difference between the revised Survey Results and the Geodetic Coordinates 2000 (vertical). Following the earthquake off the Pacific coast of Tohoku, notable crustal deformation occurred over a wide area of eastern Japan, which led to the stop of publication of Survey Results of GEONET stations and triangulation stations in 16 prefectures and Survey Results of bench marks from the Tohoku and Kanto districts on March 14, 2011 (with addition of several areas on May 31). In order to contribute to swift restoration/reconstruction of the disaster-stricken area, and to ensure stable provision of Survey Results for many years to come, the amount of future deformation was estimated by taking postseismic deformation monitored by GEONET stations into account and, after discussions with regard to an appropriate time for re-publication, revised Survey Results of GEONET stations were released on May 31. Precise geodetic surveys were conducted at some of triangulation stations, and Survey Results for the remaining triangulation stations were revised through calculations based on the correction parameters. The revision of the Survey Results of bench marks was, in essence, achieved through resurvey. High-precision 3D surveys were conducted in the Tohoku and Kanto districts and network adjustment was calculated based on the revised elevation for the Origin of the Japanese Vertical Control Network. The revised Survey Results of triangulation stations and bench marks were released on October 31. Because the coordinates/elevations of the origins of the Japanese Horizontal/Vertical Control Network were updated, and because Survey Results were revised across a wide area of eastern Japan, the revised Survey Results of GEONET stations, triangulation stations and bench marks across Japan were re-named with the following title to make users aware of the changes: "Geodetic Coordinates 2011." Marone, C. J., C. H. Scholtz and R. Bilham (1991): On the Mechanics of Earthquake Afterslip, Journal of Geophysical Research, 96, B5, 8441-8452. 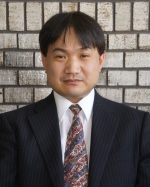 NAKAGAWA Hiroyuki, Kojin WADA, Tadayuki KIKKAWA, Hisao SHIMO, Hisashi ANDOU, Yuki KUROISHI, Yuki HATANAKA, Hiromi SHIGEMATSU, Kazuyuki TANAKA, Yoichi FUKUDA(2003): Development of a New Japanese Geoid Model, “GSIGEO2000”, Bulletin of the GSI, 49, 1-10.